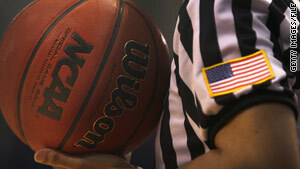 As March Madness chatter takes over the workplace, there are tips so the clueless can take part. (CNN) -- The games begin Thursday, and March Madness buzz will soon take over the lunchroom. Everywhere you turn, co-workers will chat about their favorite teams, the upsets, the injuries. Maybe you will watch the games. Maybe you won't. But maybe, irrespective of whether you plan to follow the tournament, you've ponied up to be part of the office pool. And you don't have to worry about explaining how you made your picks while filling out out your bracket. Everyone is hoping to choose that one team that comes from behind to win. So what if you always pick Gonzaga just because you like saying the name? Should it matter if you take Louisville out of the running just because that jerk who once strung you along came from there? You are in the running like everyone else, and, heck, you might surprise yourself and actually win. In these coming weeks, though, you don't want to sound like an idiot. It would be nice, you think to yourself, if you actually appeared to know what you were talking about. • Be careful not to talk about a "buzzer beater" unless it's actually happened. When they do happen, when a player scores at the buzzer (in the last second) to change the game's outcome, throw the term around wildly. It'll be what everyone is reliving, and if you feel especially bold, you can try to give someone a high-five while saying, "How about that buzzer beater?" • Discussing injuries in vague terms is always safe, since most every team has suffered some. Ideas: "They really can't afford any more injuries this season." Or, "Didn't they have a big injury this year?" You don't have to know the answer, but it's an easy way to engage with a sports nut who will gladly tell you more about some stranger's ankle than you ever wanted to know. • Tell people around the water cooler that you really admire a team's "tenacity." Mandel says that's "a good fastball no one can argue with," because by virtue of making it to the tournament, a team's got to have some serious tenacity. Other terms you can throw around to describe a team: "smart," "experienced" and "well-coached." • Something called "guard play" is apparently very big this time of year. You might shake your head and mutter, "I don't know if their guard play is good enough." Or, conversely, you can say, "Oh, yeah, I think they have a good chance because they've got good guard play." • There are some things you might say that could be risky, as they may prompt others to ask you a question in return. For example, if you were to say, "Gosh, that was a big shot," someone might ask, "Which one?" This would be a good time to spill your coffee, diverting attention. • In basketball, the word "press" (short for pressure) is used when discussing defense. So you might want to express your heartfelt concern about a team "having trouble with the press." • There are different conferences that make up the NCAA. The Big East dominated this year. You can talk about how the "Big East ruled," but make sure you don't misspeak and talk about the Big North, because no such thing exists. There is a Big 10, but it's made up of 11 teams. • "Ball movement" refers to how a team passes a ball. Any team that's made it to the "tourney," as some insiders like to say, must be strong in this realm. So you can assume you're covered if you say something like, "Wow, they have great ball movement." • A strong three-point game can make the difference for an underdog team. So if some folks are saying how a team doesn't have a chance, you could nonchalantly stroll by and say in passing, "They could pull an upset if they get hot shooting threes." Another fun phrase to toss out: "They live or die by the three." • Casting blame on referees for making "questionable calls" is highly popular. "Man, there were some questionable calls" is a good gripe to share, but only if the game was close. If it was a "blowout," a win by a large margin, your saying this would make you look foolish. It might be better to say, if people are chatting about an upcoming game, "Man, I hope the refs just let them play." • Word is that everyone loves a "Cinderella," the team that comes out of nowhere to make a good run in the tournament. If you want to sound especially savvy, use it in conjunction with the world "dance," another fun slang term for March Madness, as in, "It's always nice to see Cinderella go deep in the dance." • If you feel compelled to throw out a player's name, one you're pretending to be excited to watch, the one to know -- and one that's easy to remember -- is John Wall. Rhymes with ball, if that helps. He's a freshman guard at Kentucky and will likely go pro soon, so using his name next year during March Madness would blow your cover. Keep that in mind. • Last, and this is very important, do not -- repeat -- do not walk into work on April 1 and talk about how crestfallen you are that March Madness is over. The tournament goes by this name, but the actual championship is played in April. CNN's Eliott C. McLaughlin, Steve Almasy, Todd Leopold and Manav Tanneeru contributed their wisdom to this very important report.